I love the WeatherNerd. I find it much more accurate than other weather apps. I am always trying new weather apps, but Weather Nerd is the only one that I use everyday. Great info! Let’s me plan ahead for the day and for trips. Absolutely like the app, Don't like paying $3.99 for 12 months subscription. It is accurate and love the graph design... But Not sure it’s worth the price. 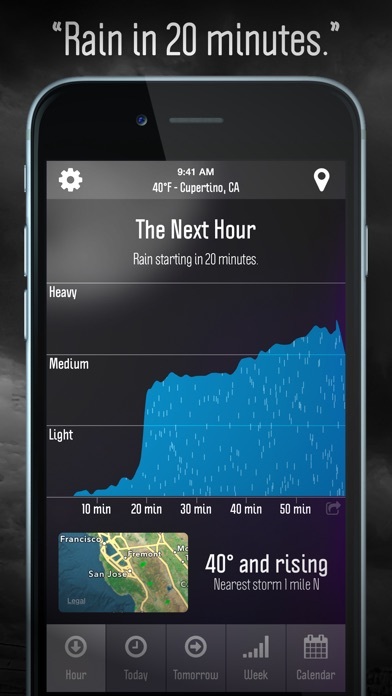 Dark Sky (Free version) is Just as Great & Accurate. But Wx Nerd has added more & more worthless Extra features again = (justifies??) extra subscription cost? 😠 Wx Nerd is not $3.99 a year good. It's not Dark Sky's Good. I'm an over the top weather enthusiast checking the app store almost daily for any new or updated weather apps and I can tell you that this hands down the best use of the Dark Sky API on the market. Way better than the Dark Sky app itself!! Also, very good customer support. Last update corrected instability issues with my IPhone X. The last two updates improved on a version that was unstable on my IPhone X. Still had to repay for my lost subscription from that unstable version that lost my subscription, but the app works well again. Use the App daily. Accurate and easy to read. I do miss the “nerd out” button. Stop asking me every freaking day if I’m enjoying the app! Easily the Best weather app! 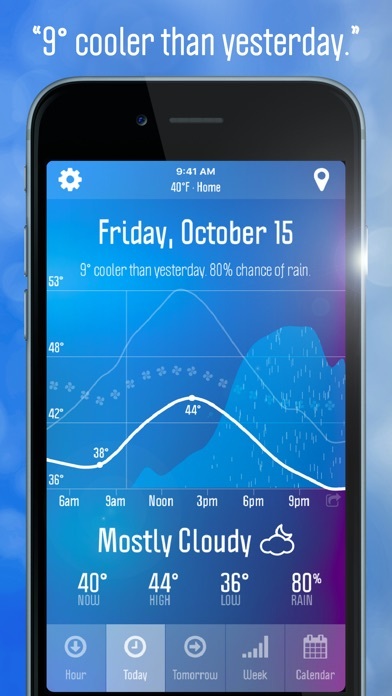 The way this app visually lays out the weather forecast is clear, intuitive and accurate (LOVE the clouds by the way!) My only enhancement request would be some further refinement of the ‘radar’ page. The deeper radar options (like black mode and the ability to select different radar layers)that are present in other weather apps is the only reason I keep a couple other weather apps installed; I’d love for WeatherNerd to be my ONLY weather app! Thanks for the update. Best Weather app. As it shows your calendar and then the corresponding weather. Hands-down the best weather app I’ve used (and I’ve used a lot). Great support from the developer too - very responsive. I like being able to quickly see the week at a glance to see the temperature and precipitation. When I select any of those days, it shows the temperature and precipitation over the hours, which is convenient for planning. It’s also easy to change the location as I travel. I’ve renewed my subscription and will continue to use it. This is what I've been searching for! Only one small thing that would make it perfect - it needs to have a widget that shows the current conditions. I can live without it since I have dark sky for the current temp widget then the three widgets from this app below it, but it'd be a nice thing to have. But besides that I wouldn't change anything. Looks great, works great! Definitely my go to weather app now. I was loving this app until the update. Now my heat index is gone. I don't know if it will have the wind chill when winter comes. I am seriously considering not renewing my subscription this Autumn. If it is corrected before then I would most definitely keep it! This is one of my favorite weather apps. I do have a request. Could you please make it work in landscape mode? I almost always have my iPad in landscape and this is pretty much the only app I need to rotate to portrait to use. This app is awesome! I love it’s ease of use and ability to display so much on the screen without it feeling cluttered! Thank you for developing it! Very nice work! Thank you, also, for your recent updates! I feared this app was abandoned by the devs, so I was excited to see them breathe new life into it!! My only gripe is with forecast.io. I have found it to not be accurate with anything greater than 1-2 days out. Anything more than 2 days out seems to change by the hour. This is not the developer’s fault, it just “is what it is.” PS...I love the clouds also! I’ve liked this up till recently. But for some reason the daily forecast reminder has ceased to function. I’m coming up to my subscription renewal and I won’t be renewing because of that. I’ve updated my review to reflect the response from the developer. They’ve fixed the daily forecast, which now works fine, so I’ll definitely renew my subscription. Great app. This has everything. The only reason I didn’t give it five stars is because there are no other options for background color and the blue gets a bit old. Weather nerd is my go-to weather app. 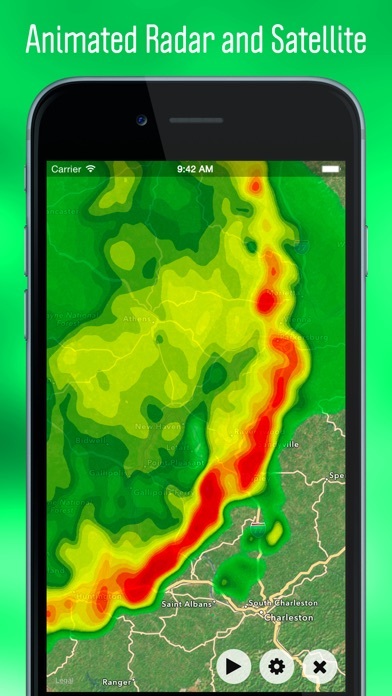 It’s this, DarkSky (for rain alerts since I have a Jeep with no top) and Radar Scope for severe weather. And that’s it. I love seeing the temps and wind throughout the day, and the calendar overlay is a nice perk. It’s very well designed. I like the app but I’m not sure how to interpret the graph and data. It might list 68% chance of rain for the day but when checking the graph it goes no higher than a 23% chance. So what is it - 68% or 23%? Actually I just give 1 star and say “Worst app ever!” any time I get interrupted by an unsolicited request for a review. This my favorite weather app by far. I love the smart design which presents a lot of information clearly and cleanly. This is an app that you will recommend to your friends. Very nicely done! Update: (2018-05-28) App updated for iPhone X. Still some concerns about future, if it will continue to be updated and the timeliness of those updates, but right now working well on iPhone X and iOS 11. Original: Not a bad app and has lots of data points for weather nerds (obviously), but app hasn’t been updated in quite some time, including iPhone X resolution. Probably won’t renew subscription unless there’s some update love shown by the developer. I’ve learned to see the current weather and understand the forecast in just a few second. It’s nice. Used to love this app. Now the subscribe button crashes the app every time. Even after I paid the $3.99 to update - it says I still need to subscribe and when I hit the button, the app crashes. I want a refund. Update: subscribe now working but it wanted me to pay another $3.99 for the subscription. So $3.99 just to download an app that won’t work without another $3.99? Something’s not right . . . . Update2: subscribe was working . . . but now it’s not . . . again. Well organized, efficient, quickly presents abundant info on easily absorbed format. My goto app every day. The bug was fixed. Good app. Love the new iPhone X update! I ride my bike everywhere, so it’s really important for me to be able to quickly glance at a weather forecast and understand what equipment I need. Many other apps have rain, but don’t quickly show wind or UV. This app has everything I need all together and I’ve never been happier with a weather app! I’ve been using this app for years, and I’m glad it’s updated to support the iPhone X now. I’ve tried dark sky, weather underground, accuweather, and none of them have been able to display as much information as this app does in such a straightforward way. This app is well worth the subscription, and incredibly accurate and informative about the weather. Absolutely love this app, use it daily. I think the developer is abandoning it though, my emails to support haven’t gotten a response. Doesn’t support the new iPhone X resolution. Will bump back to 5 stars if this app is updated.. UPDATE: glad to see it finally was updated, unable to re-subscribe though. The app just crashes.. 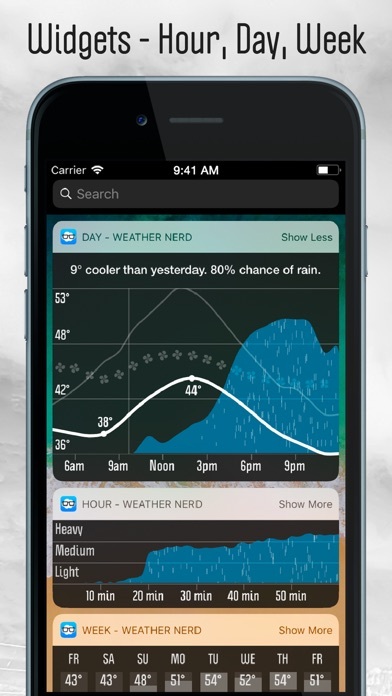 Weather Nerd used to be my absolutely favorite weather app for years. I absolutely loved the graphic interface to get a quick overview of the day. However, last night I was asked to renew my annual subscription and I just can’t justify paying the dev team more often than they update the app ... with the last update more than a year ago and the UI still not iPhone X friendly, it seems pretty clear that this app has unfortunately been abandoned. I recently emailed developer regarding typo issue on weather saying high 89 and low -20. I had asked them to fix the issue. 5 minutes later I checked again and app just updated....now low is -105! For a paid app you would expect things to be working better than the free ones. Waste of money for unreliable subscription app!!! This is generally a great weather app. I love the graph showing temperature, wind, and precipitation for the day. It’s the best visualization of the day’s weather that I’ve seen. That said, the app hasn’t been updated in a while and doesn’t support the iPhone X screen size. An update that supported the latest devices would get this app to 5 stars. I don't know why I have so many weather apps, but after using them all quite a bit, here is my assessment. Yahoo weather is my favorite casual weather app. Flick through the cities and get a general feel. Dark Skies is elegant. Very nice to look at. But Weather Nerd is the best if you actually want to know how the weather is going to be. It's an informer. Most comprehensive and valuable data in an awesome presentation. You can completely geek out over the weather in this tool. Well done. — Feb 2018 update: I’ve obviously appreciated and used the app, have been a supporter online and with friends as well as financially. I must admit I am disappointed there hasn’t been an update for iPhone X (no update of any kind for a while). Hopefully one is coming soon. Absolutely love this app, use it daily. I think the developer is abandoning it though, my emails to support haven’t gotten a response. Doesn’t support the new iPhone X resolution. Will bump back to 5 stars if this app is updated.. I love this app but it needs support for the iPhone X.
I like that it doesn't have any of the cruft of the other weather apps. Clean UI. However, it thinks that "tomorrow" starts at 6PM on the previous day, which drives me nuts because the widget shows the wrong day in the evening. This could be an option, but isn't. It also doesn't show the current temperature in an easy to see way. I am updating my review to 3 stars because the app seems outdated now. It looks like crap on my iPhone X. I will not be paying again till they upgrade. The best of the best, do not change anything. Unbelievably accurate and informative. The best weather app I have used. Wow...love this app! Comprehensive and detail rich as well as accurate and fun! One of the best, I just wish it had a proper IPad landscape view like many competitors do and an IWatch version. This is my main weather app, use it countless times a day, love love LOVE it! That said however, this app seems to be extremely slow to update and add features, like basically an annual cycle. If the makers of this app put just a tad more effort in, this would be the #1 Weather app in the store. I mean it’s barely supported now and it’s STILL very, very good. Coupe things: 1) put some thought into how to make the radar better, apps like ‘Storm’ by Weather UG are light years ahead) and 2) add iPhone X support, it’s been a couple months now, let’s take the couple hours of dev time it would take to modernize get with the program! ...PLEASE add landscape orientation mode for iPad. Also, please add iPhone X support. Thanks! Definitely the best and most detailed weather app available at the moment. Only two things prevent me from giving it a 5-Star rating, inclusion of air quality and a watch complication. I love the WeatherNerd app, but it’s pretty crazy that one of the only apps I actually pay money for is the one that isn’t optimized for iPhone X yet. Very annoying having the black bars on the top and bottom of the screen. The most accurate weather information I have used. Update: up until about a year ago this was a really accurate weather app for my area. Not accurate any longer unless you consider plus or minus ten or more degrees to be accurate. I don’t find that useful. This is a nice change from other apps. (and I have many) I’ve been on a quest for the perfect app for years now. I know I’m not the only one on that mission. If I could afford it, I’d hire a developer I know to build my version of the perfect weather app. That said, I am enjoying this one. I do wish it would work in landscape on my iPad. I have thoughts about what I’d like to see with this one but I need to play with it and think about it a little more. Right now, it’s my favorite. I love the graphics in this app, but it’s time for an update. Crashes repeatedly since the latest IOS update. Update: Within a week of my last review, Weather Nerd began to crash each time it opened. After some investigation I found that the problem was access to the calendar. If this happens to you, turn this feature off in Settings - WeatherNerd - Calendar. Just toggle the Calendar slider and the app will open, but without displaying your calendar events. Until this problem is fixed, I can’t give the app a rating higher than two stars. I paid 3.99 for this app, and then a year later it’s unusable because my “subscription” has expired. When I bought this app, there was no clear notice that the fee was for one year subscription. Scam. No thanks. Great app. Accurately provides essential weather info in graphic form on timeline. 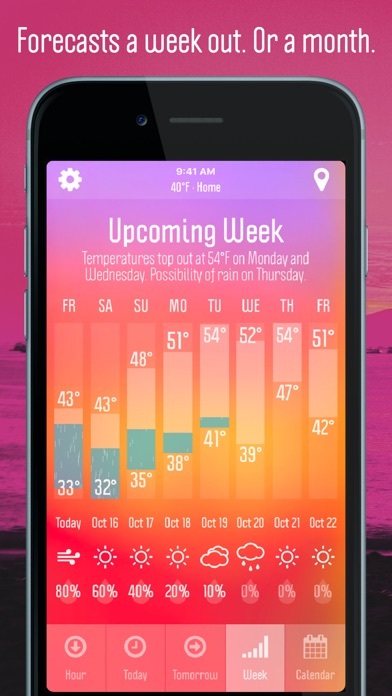 This was my favorite weather app, but when the subscription expired and they hadn’t release an update in a year, I decided to go elsewhere. If this gets updated and includes better support for the iPhone X, I’ll reconsider a subscription! Will not be paying anymore for an app if it doesn’t support the X. Now this is useless without a subscription, so I'm changing my previous 4 star rating to 1 star. Update: 1/19/17. Our location received over 2 inches of snow, yet the app shows only a little over 1/10th of an inch in historical data. Can’t be right. Seems consistently wrong in other areas as well. Noticed the last update to the app was a year ago. Has the developer abandoned the app? It really was a good concept. I will not renew. Update: 1/29/16. I enjoy using this app. Mostly, I use it for historical data. Won a few bets with my wife about dates it snowed last year. Now comfortable with the UI. Developer quick to respond to my questions. Well done and managed app. Upped my rating from 3-5 stars.